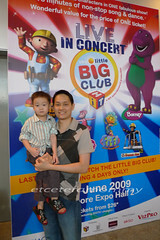 We brought Ryan for The Little Big Club Live Concert at the Singapore Expo on the Sunday of 7th June. I had booked the tickets like a month earlier, which I usually does, so to reserve the best seats. A week after I made my booking, the organiser announced a 10% discount for all Toys R Us card members. Bummer! Speaking of early birds benefits. Well, the concert better be good. We reached the Expo around 4.30pm. ThisÂ was the second time we went to the Expo for a concert. 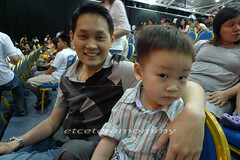 The first time was Thomas and Friends concert back in Nov08. 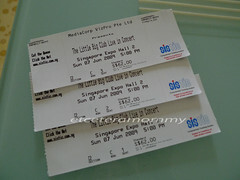 I’ve always prefer the Singapore Indoor Stadium, where parking isÂ usually more a bliss and much nearer from our place. Immediately after we got in the hall, I went straight to theÂ booster seat counter. I was shocked to see people squeezing, pushing,Â screaming atÂ the staff for a piece of it. There was no Q and I could see the booster seats are running out. We definitely need one for Ryan so I had no choice but to squeeze myself into the chaos. Luckily I didnt have to ‘wrestle’ for long. Another staff saw me and I quickly made eye contact with her and pointed to Ryan indicating he needs a booster seat. That’s how we got ours. Hate it! Totally no system. We got into the concert hall and I must say I was not awed. To say the least I was very disappointed with the props. This is by far the worst stage we have seen of all the concerts we have been since we got here 2 years ago. When the show started, there were no surprises we were being let down. 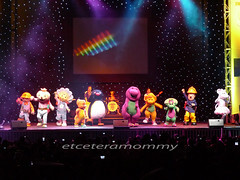 The stage was no more than three small LCD screen on the sides and center stage, a band, and a few mascots donning costunes from shows like Bob The Builder, Fireman Sam, Barney, etc, running around on stage, supposedly dancing and singing the themeÂ songs with the band. I was not thrilled. $180 for such a show is really a ripped off as compared to Mickey Mouse Live, Disney on Ice, etc concerts we have been to previously. 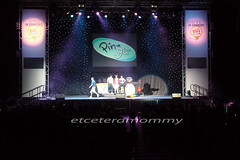 Pingu, being one of Ryan’s favourite only came on stage for barely a minute. Ryan was so sad when the little penguin left the stage and never came back on. Personally, I will not recommend this showÂ to anyone but I’m glad that at least when I asked Ryan towards the end of the show ifÂ he enjoyed himself, he happily said ‘Yes, I like the show. I want to watch again’. OK la.. at least he found joy but for the amount of money, I am not so sure if it’s worth it. The ending which was also the highlight of the show when all the characters came out.